For this task Moulin-Rouge gets a detachment of his own unit, the 89th half-brigade of line infantry supported by two groups of the formidable 14th half-brigade of light infantry called "the blacks" because of their dark brown coatees and last not least one troop of the 8th regiment of hussars. And then there is this regimental surgeon who has recently arrived from Paris. He is to accompany Moulin-Rouge to gain experience in the field. 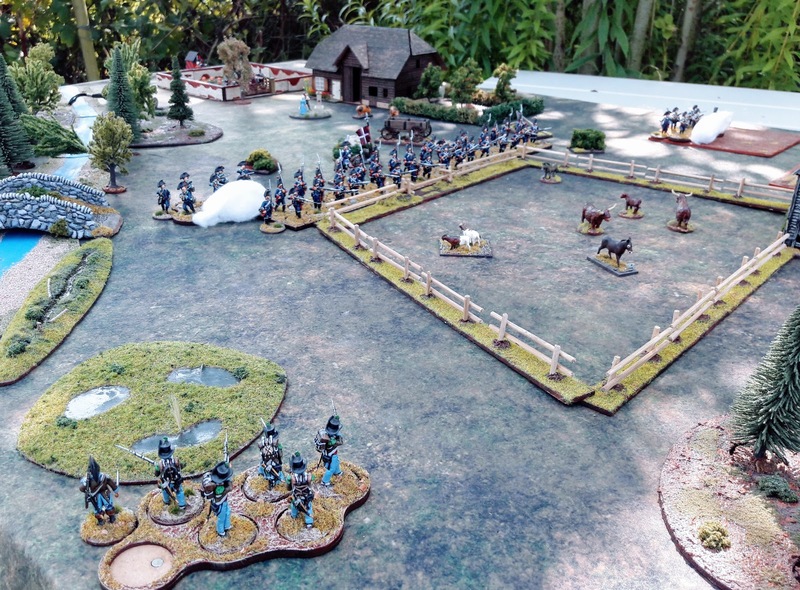 On the Bonstetten farm there is business as usual, when suddenly a farmboy soaked in sweat arrives from the neighbouring hamlet and wishes to speak to the local commander: "The French are coming" he claims to know. Four or five dozens of blues and blacks he reports to have seen, and hussars as well! Captain von Siebenthal is the commanding officer of a company of the bernese "Oberland" batallion of musketeers. At his disposal is also a half company of sharpshooters and one four pounder light gun. He knows that his inexperienced men could not withstand a serious french attack. Nevertheless he decides to oppose the french advance and orders to throw up some breastworks. 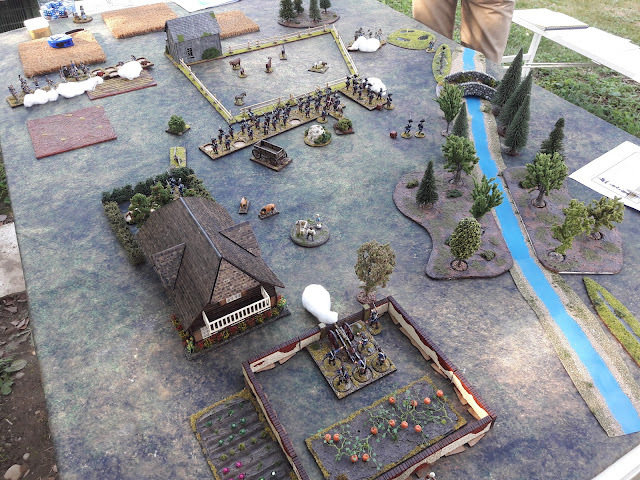 Lt von Gunten with his light gun is ordered to take position in the walled vegetables garden, the musketeer company gathers in the center of the french approach line and the sharpshooters have to cover both flanks - a textbook deployment. The bernese deployment: musketeers (line infantry) in a central position, sharpshooters (skirmishers) on the flanks and the light gun in the walled garden in the rear. Etienne Moulin-Rouge has confidence in his men's abilities. The men of the 14th half-brigade of light infantry are a particularly tough lot and the swiss conscripts will not stand a chance to resist the french attack. 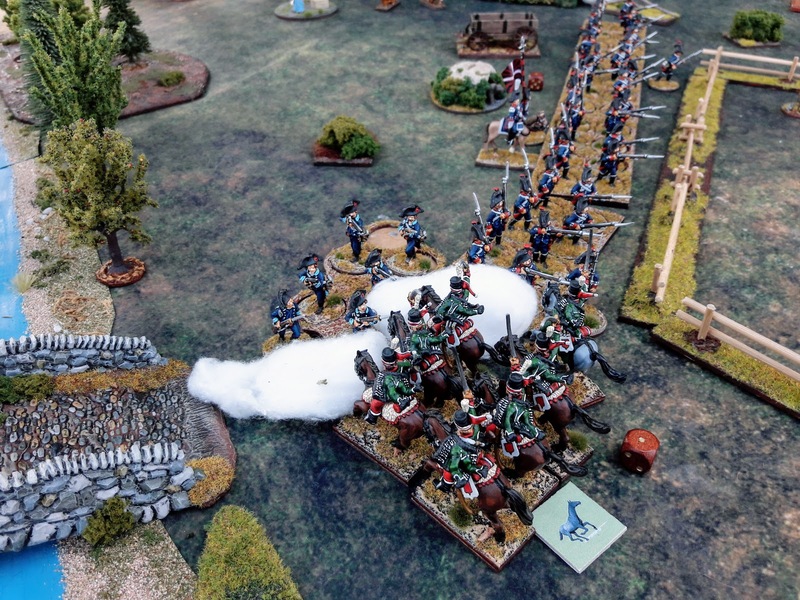 So he sends Bastien "le petit" Robert with one group of the 14th light to his left flank. 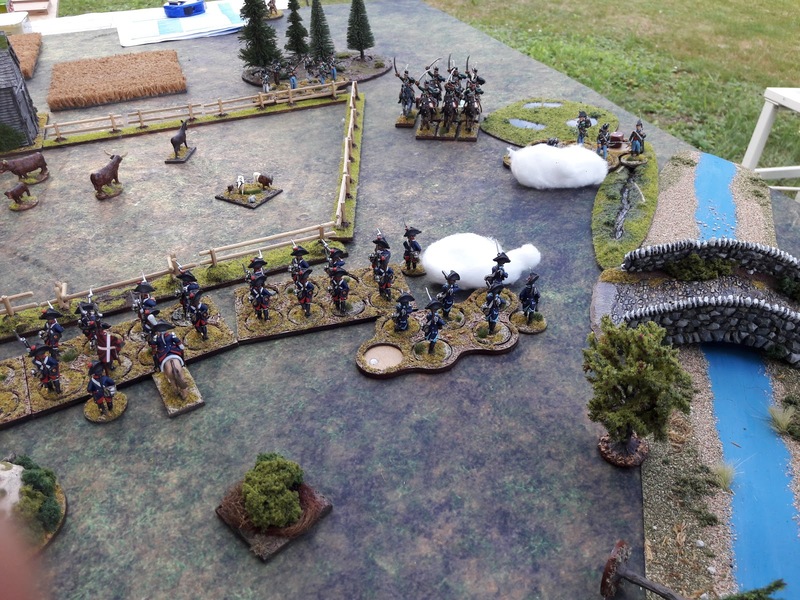 They have the task to drive off the bernese sharpshooters and prepare this flank for an attack of the hussars. 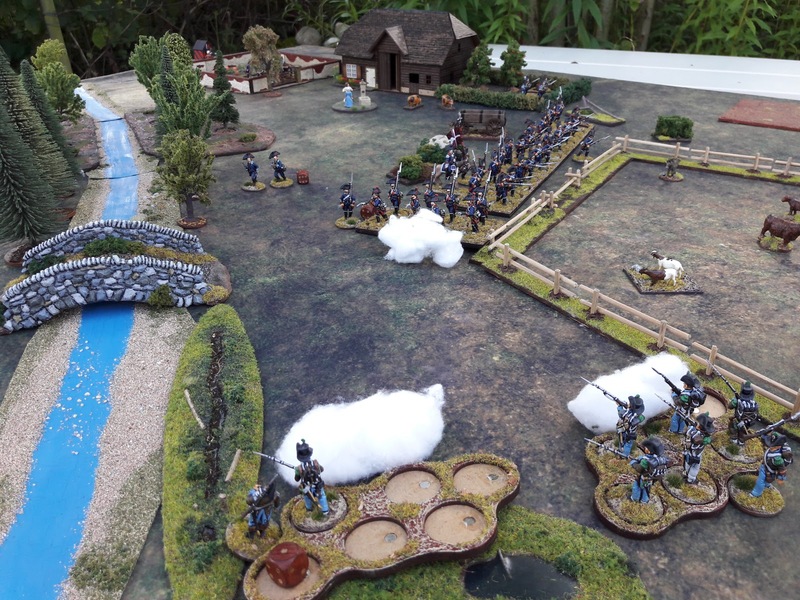 Meanwhile Moulin-Rouge forms up his detachment of the 89th on the right and fires at the second group of bernese sharpshooters. The salvoes of the 89th line infantry on the right flank start to make an impact on the sharpshooters: their casualties are increasing and they have to fall back. 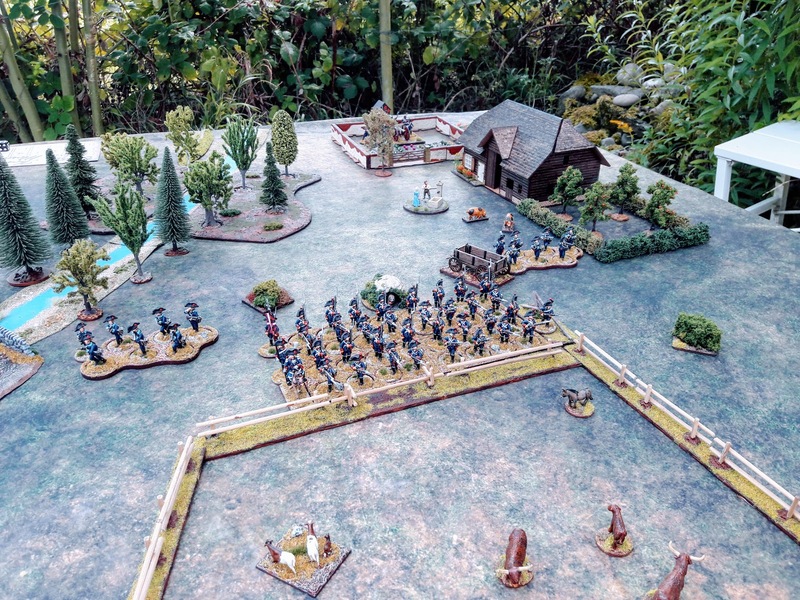 Captain von Siebenthal now sends a messenger to Lt von Gunten, commander of the light gun, with the order to open fire on the french line infantry. Johann von Gunten has spent one whole year studying at the Artillery Academy in Berne and he knows how to handle his gun: With magnificient regularity the four pounder spits fire and smoke and roundshot hits the dense formation of french line infantry and is taking toll. Even Moulin-Rouge himself is wounded by some fragment! Surprisingly the surgeon from Paris proves to be competent and is able to revive his commander in a short time. Since the french attack is making very little headway, Cpt von Siebenthal orders his musketeers to wheel backwards to the left in order to cover the bernese left flank where his sharpshooters have retreated far back into the orchard. This is a very difficult manoeuvre for the inexperienced conscript men and they shuffle and stumble towards their intended position. 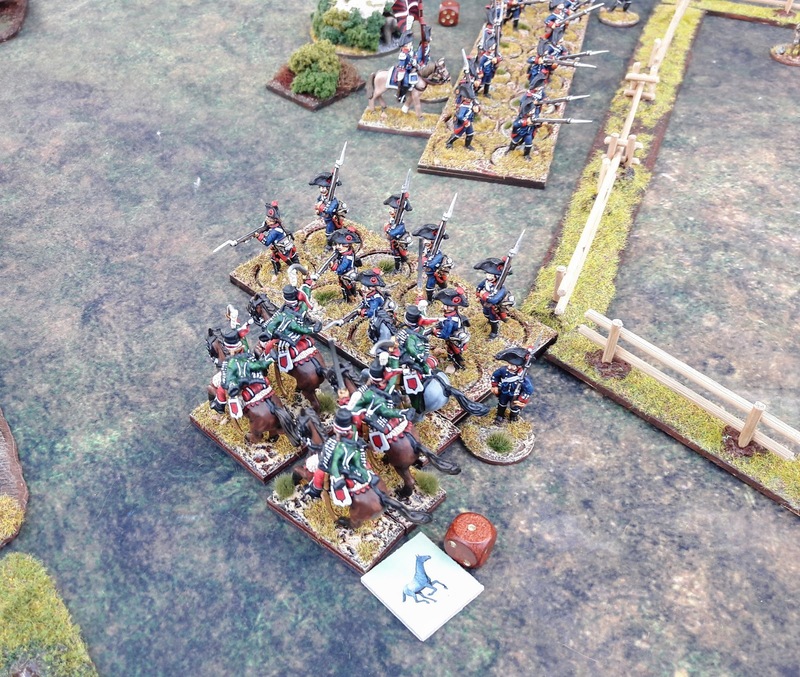 Now this means business for both sides: The french hussars are galloping towards the sharpshooters while these are firing desperately trying to decimate the hussars ... and then there is the terrible impact when horses and sabre-wielding hussars crash into the sharpshooters from the bernese highlands! 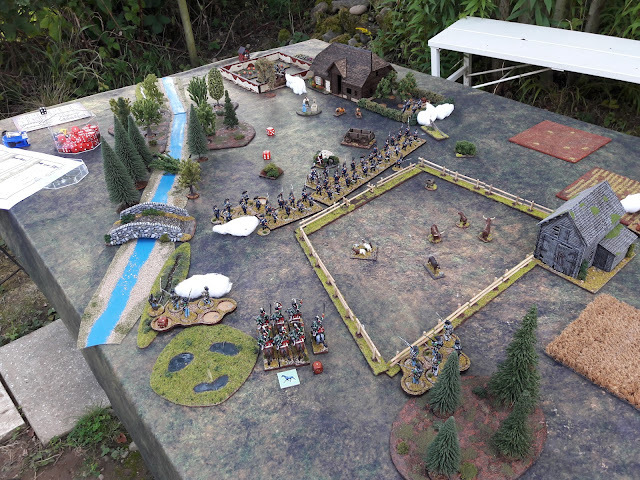 This close combat's death toll is heavy: The group of sharpshooters is almost wiped out by the hussar's sabre cuts and the few survivors seek shelter far back of the combat line. 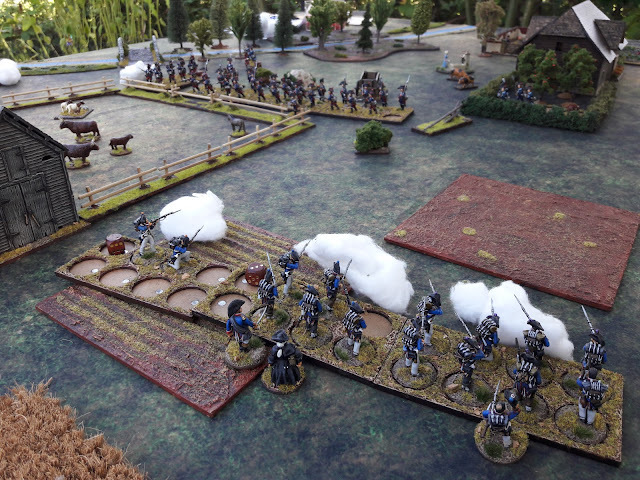 But the hussars too take some casualties. Now comes the moment of truth for Sgt Johann Aebi. He has been detached from the main line of musketeers to stiffen the bernese right flank and from this position he has been witnessing at close range the defeat and flight of the sharpshooter group. What shall he do now? Fire a salvo at the hussars would be a safe bet, but the brutal slaughtering of his comrades got him into a rage. He orders to fix bajonets and then assaults the rallying hussars with a roar! What will be the outcome of this mad dash? The attack of the bernese musketeers comes out in triumph! The whole group of hussars caught off their guard is killed while the musketeers miraculously remain unscathed. Now 1st Lt. Moulin-Rouge is running out of options. On his right flank the 89th is loosing men under the fire of the light gun while it does not manage to get the bernese musketeers into trouble. 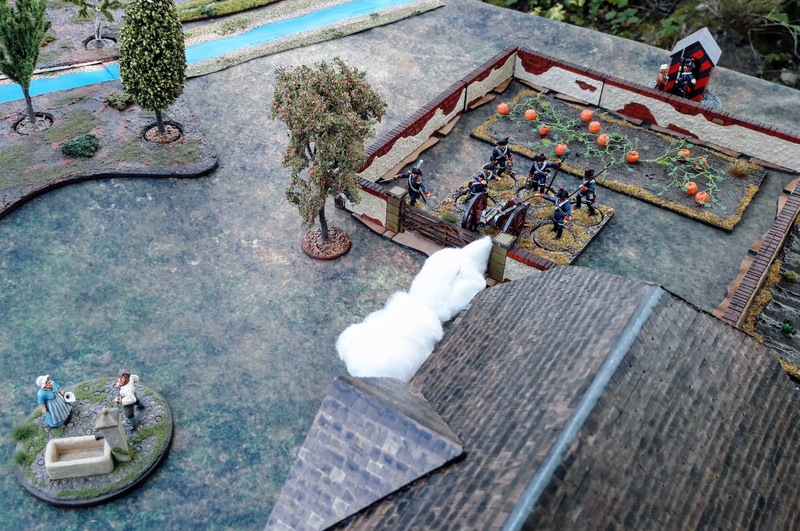 In the second group of the 14th light, a ranker has stepped up to take the role of Sgt Pernod. They have now arrived on the french left flank and are trying to put more pressure on there. Losses are now rising on both sides - and the french forces' fighting spirit is slackening! Too many of their leaders have been wounded or killed, too many groups have been decimated and forced to fall back - the winning accustomed "bleus" and "noirs" don't like this. Lt Moulin-Rouge feels control slipping from his hands and so he orders his remaining forces to retreat from the fight. The bernese troops have bravely repelled the french attack! 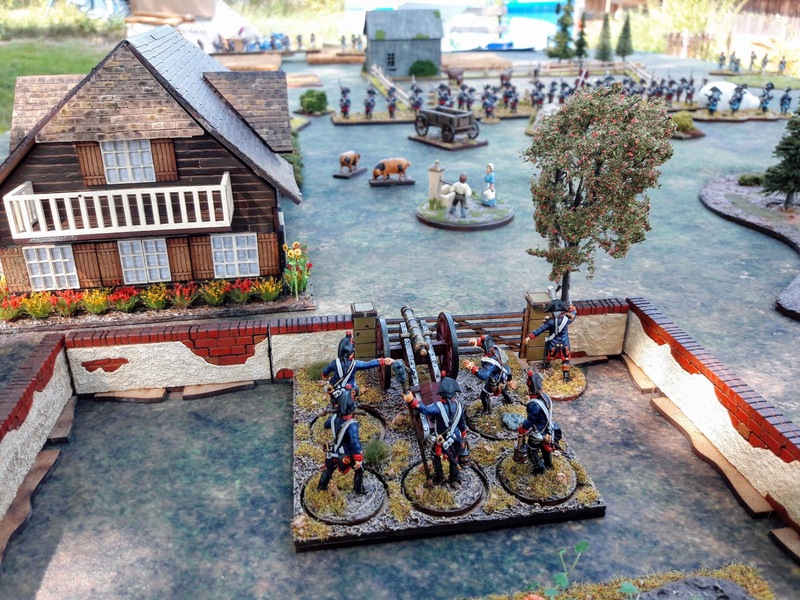 the morale of the French started at a level of 11 and has dropped to 2. 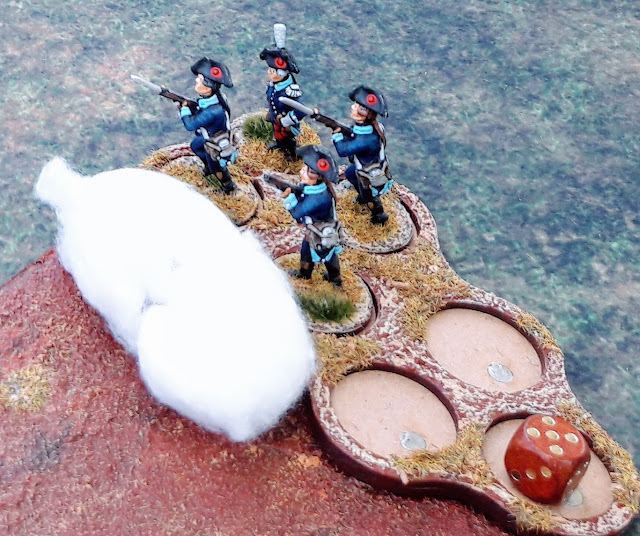 The french commander quits the fight. It has been a cool and tense game, and I was surprised by the Bernese being victorious. I expected the better quality of the french troops (line infantry and light infantry) to prevail against the humble Bernese (conscripts & volunteers, skirmishers). we forgot to add the +1 to hit for skirmishers and light infantry shooting. The sharpshooters and the men of the 14th light would have had considerably more impact in the early stages of the game and probably the whole game would have run faster. the Bernese had paid in points for two elements of breastwork, but (fortunately, I say as the french player) we forgot to place them. the fire of the light gun aimed at the french infantry passed very close by the bernese musketeers. The musketeers should either have got their share of the hits or should have moved further away from the line of shot. 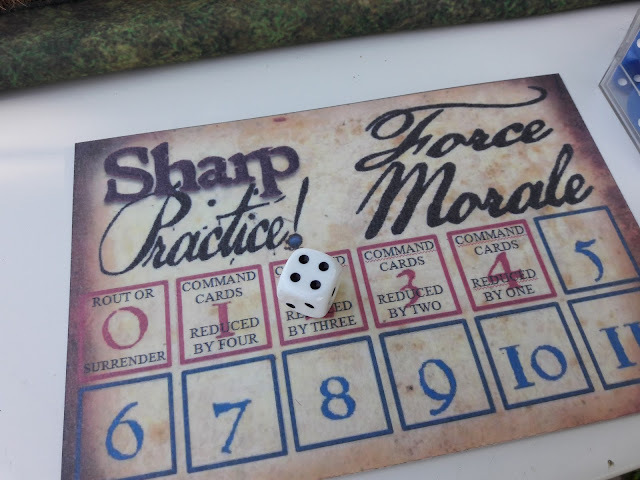 Anyway the game ran smoothly and despite of our lack in (sharp) practice we only rarely had to refer to the rules. It has been a game full of excitement and fun and I am looking lorward for a rematch against the "petits Suisses".